It’s not as if beverages weren’t supplied… but this way looks more fun! There was an amazing turnout for the Family Farm afternoon on Sunday, making short work of the planting and other tasks and leaving time for lots of play… and snacking. 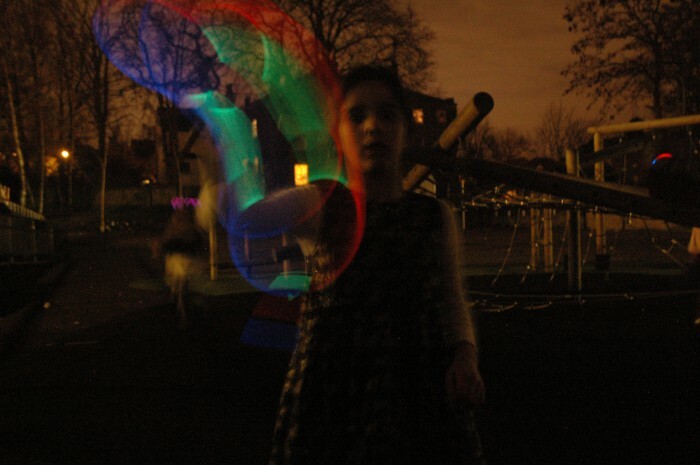 Take a look at the great pictures from Michael Preston, Fiona Cushley and others. 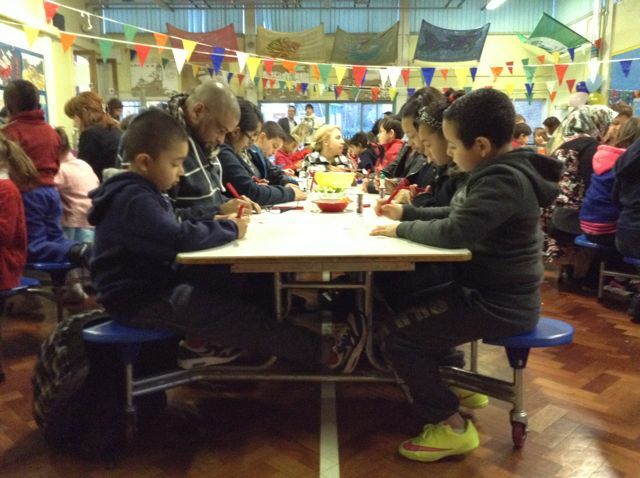 Thanks to all the families who came along – and to the many brilliant school staff who showed up on a Sunday, too. So many people have helped to bring this massive project to fruition, and there will be plenty more to come. Please make sure that Sunday 17th July is in your diaries NOW. It’s the final Sunday of the summer term and from about 10:00am, we’ll be harvesting and cooking the crops that we’ve planting – making a wonderful Sunday dinner for everyone there. Watch out for more details nearer the time. It was magic, it was riotous… it was everything a party should be. Christmas came early to Tufnell Park this year. It may only be 4th December, but at Winter Wonderland this afternoon it felt as if everyone was ready to celebrate. The party was a fantastic success, and so many people worked hard to make it happen that it’s impossible to mention them all. This year’s Wonderland co-ordinator, Lou, has got to have a special thank you from all of us, though – as does Santa himself for showing up. It’s a busy time of year for the old fellow, but he remembered Tufnell Park. It also seems that more people came through our doors than ever before, and you know what they say: the people make the party! 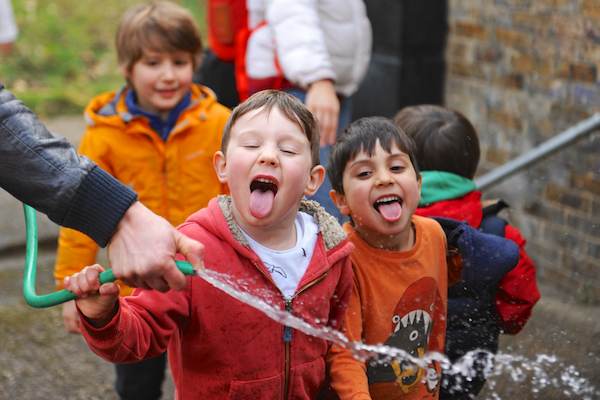 There will be a full gallery of photos up soon but meanwhile, here’s a tiny taster of the fun that was had. Thank you, Caroline, for most of the photos below – and to everyone else who sent in pictures. So many good boys and girls at Tufnell Park. The Sound of Music… Ms Andrews has got to be just past that peak. Santa again – the sledge he rode in on. Christmas IS about cake – we all know that. Don’t mess with the cake fairies! O, that crazy wild snow pit. Under lights, those beautiful balloons came into their own. Spa was busy all night – as ever. But eventually, it was time to go home. The editorial team never rests… even during picnic time. The great outdoors – so over-rated, right? Nonetheless, with blankets and floor mats, colouring pens, loads of lovely food and balloons to kick about, there was plenty of fun to be had. Thanks so much to everyone who came: it really was great to meet you. Come again on Friday 9th October, 3:45pm for the HSA AGM in Andromeda Class. That’s the way to have your say. And there were plenty of healthy options. Ms Tizard didn’t mind doling out the odd crisp, too. 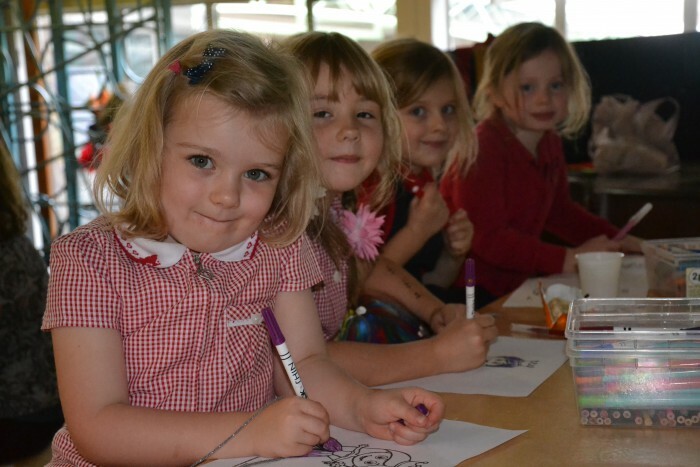 Out come the colouring pens, and it’s time for some serious concentration. Just look what HE’S drawing! Tufnell Park. It’s just a sort of enchanted castle, really. 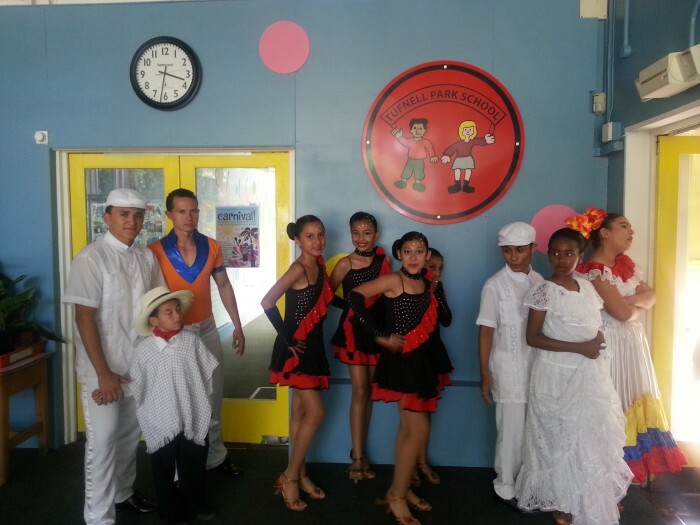 New uniform, Colombian style: brilliant young performers from the Gotitas de Sabor dance academy lent our carnival Latin pizazz. 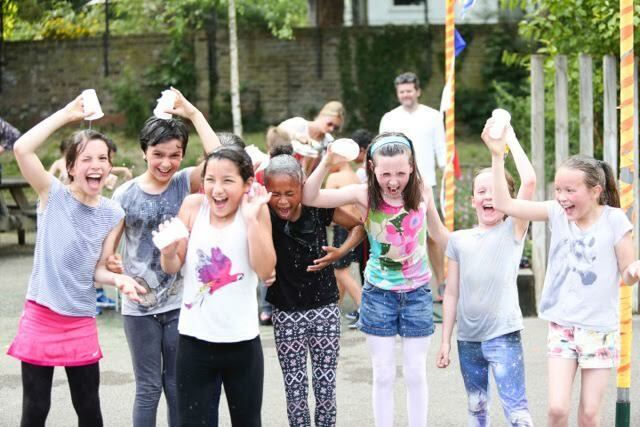 We know the sun always shines on Tufnell Park, and never more so than at the Summer Fair Carnival! Set up is not for the weak. The glory that is bottle tombola. Where would we be without the rum punch, ladies? You got it, we flame-grill it. It’s open, and they’re ready to party. She is REALLY happy about that iPad. Reverence for the shirt signed by Ian Wright. Our tremendous parent-chefs stayed on to feed the cleaner-uppers. It’s all over but the ballooning. Next year, we need to supply sprinklers. Well, it didn’t rain! The beautiful weather meant our kids each ran their 20 minutes in scorching heat around the school playground, clocking up 200m per lap. Not that the sunshine slowed them down, or dampened the atmosphere: they just poured the drinking water over their heads and got on with it. As always, it was a truly fantastic effort by all involved. Thank you to photographer and Cygnus parent, Juliette Neel, for the great pictures. There will be more to come, and you can visit the school site for a couple more. Fun Run just makes you feel good all over. For some, it’s just easy. For others, easier with a bit of company. And there’s more than one way to make a splash. But in the end, everyone’s a winner. The cookbooks are here!!! Buy now, for only a fiver. Our beautiful school cookbook – 50 glorious recipes for you to try at home. The jewel in Tufnell Park School’s crown, some might say, is not a gemstone but a pilau… or a paella… or a risotto. 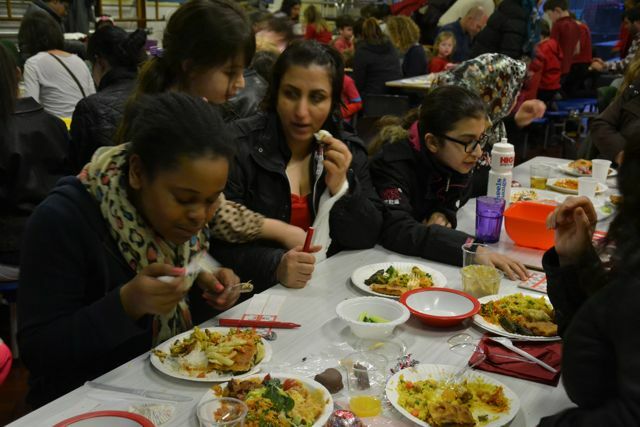 It is no secret that we pride ourselves on the variety and sheer tastiness of the food that our parent community produces for events such as the school’s International Evening (the next one’s coming up in September), Give & Gain Day in May and Family Bingo last term. Now at long last you can try out some of those recipes yourself, from the 50 included in our very first school cookbook. The interior is as beautiful as the cover, with the tales behind recipes and pages for cook’s notes so that, if you choose, you can add to the family lore. Thank you, star designer Lisa (mum of Eva in Draco) for your amazing skill and dedication to this one. Cook book interior – it’s a delight. Contributors often included the family tales that lie behind the receipes. 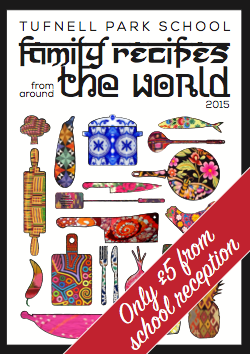 Sections are divided into geographical areas by a colourful cooking pot graphic. How to get hold of a copy?!? Take your £5 to Andrea at the big, yellow front desk and get going with the borek before nightfall. And as if inspiration were needed, take a look at the pictures of Family Bingo night in March – the brand new gallery has just gone live. How to say “thank you” loud and long enough to everyone who helped transform – metamophosize! – the shabby insides of our school on Give & Gain Day? Make room for the teams! So many parents showed up to help that it was standing room only in the corridor. 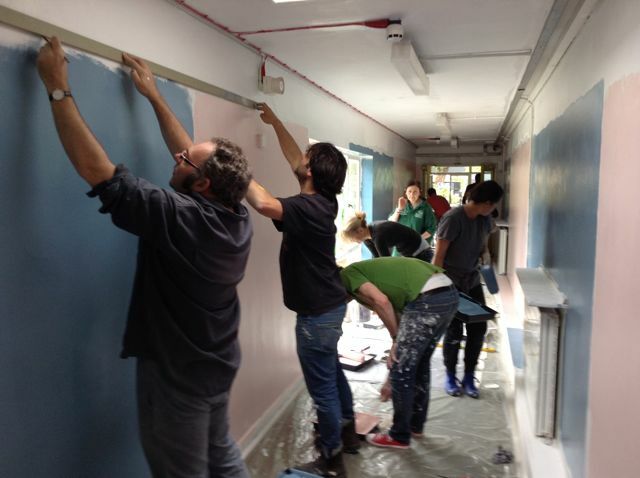 Two commercial partners – Santander bank and Jewson – gave cash donations, and the lovely people at Chris Stevens on Holloway Road enabled us to buy a veritable ocean of paint for much less than it could have cost us. And then, the show of goodwill and volunteer muscle on Give & Gain Day itself was nothing short of amazing. About 50 people – business volunteers from Santander, local councillor, Kat Fletcher, and many, many wonderful school parents – showed up during the day to help get the work done, and to bring cakes and other food to keep the volunteer army marching. Our design team, Rachel and Patrick – both parents at the school – have donated extraordinary amounts of time and professional skill to make this happen. They’ve been assisted before and after Give & Gain Day by production designer Adam and a small group of apparently tireless parent volunteers. Thank you all – your commitment has been phenomenal. Though finishing touches are still to be added, the scale of the metamorphosis is fully apparent. What a fantastic effort by the community: it feels as if we really can do anything if we do it together. Aga and Panico: we salute you! The brilliant Chris Stevens staff couldn’t have been more generous to their local primary school. Parents not only volunteered in numbers – they even looked happy to be here. The small-but-hardworking team from Santander really didn’t HAVE to come in school uniform. Have these children never seen a lawyer paint a door before? We all pray that Andrea likes her new desk. Volunteers take a well-earned lunch break. Thanks to everyone who provided this beautiful feast. After lunch, a team from Year 5 turned up to do their bit. While paint was drying, teams split off to move the big planters outside Ursa and Andromeda. And those dots got more and more interesting. …don’t leave me here alone! End of Give & Gain Day, and the core team were still at work. Architect Patrick put time in its place. And anyway, no project is complete until blessed by the hand of Elvis. It appears as if Adam doesn’t even want to leave. But is Rachel making a break for it? That’s 3:25am, by the way. Time to go home. Paper mâché, tissue paper, paint, cardboard boxes, tape, glue, feathers, flowers, fur, fabric and a million tiny chicks are all packed up for another year. 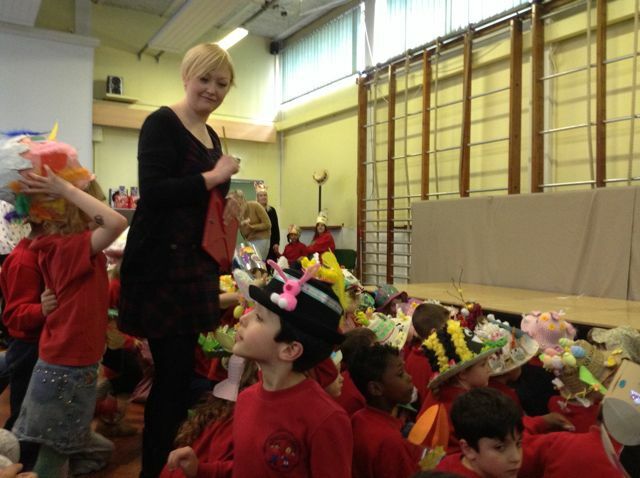 The glorious Tufnell Park School hat parade has been and gone… but we still have our memories. Check out the new Easter Hat Parade gallery on this site and see if your child’s/ family’s/ crafty cousin’s handiwork has been immortalised there. And thank you, everyone. The HSA only provides the prizes for this event, but the delight is universal. Judging winners is a nigh-impossible task, but our LEA governor, Cllr Kat Fletcher, grabbed her clipboard and took it on with gusto.